‘COMPANION CHAOS’ – THE CHAOS IS OVER, NOW IT’S TIME TO CELEBRATE! The world of Star Wars™: The Old Republic™ is full of surprises. Today, we are announcing ‘Subscriber Rewards’ coming April 3, 2018. In a galaxy characterized by combat and treacherous betrayals, it is important to celebrate alliances. Nothing is more important than our relationship with each other and our loyal companions. 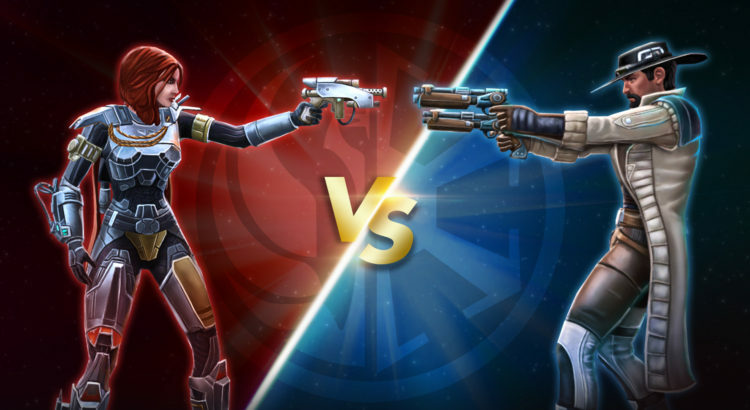 In honor of the alliances we all create with our companions, all our premium players will receive the legendary Mandalorian leader, Shae Vizla and the infamous smuggler, Nico Okarr join your team of companions. These iconic Companions will join your team, if you have a premium status on April 3, 2018 at 12:01AM PT. All active Premium Players as of April 3, 2018 at 12:01AM PDT//8:01AM GMT will receive the companions, Nico Okarr and Shae Vizla on/by April 5, 2018 by 11:59PM PDT//7:59AM GMT. You can claim your new companions beginning April 5, 2018 via in-game email at 9:00AM PT.